The last article was about line resistance and inductance. Now we will discuss about line capacitance and conductance. We already said that leakage current flows between transmission lines and ground and also between phase conductors. Leakage current flows to ground through the surface of insulator. This leakage current depends upon the suspended particles in the air which deposit on the insulator surface. It depends on the atmospheric condition. The other leakage current flows between the phase conductors due to the occurrence of corona. This leakage current also depends upon the atmospheric condition and the extent of ionization of air between the conductors due to corona effect. Both these two are quite unpredictable and no reliable formula exist to tackle these leakage currents. Luckily these two types of leakage currents are negligibly small and their ignorance has not proved to influence much the power system analysis for line voltage and current relationships. Here we will ignore the leakage currents so we will not show the leakage resistance. Inverse of this leakage resistance is called line conductance. 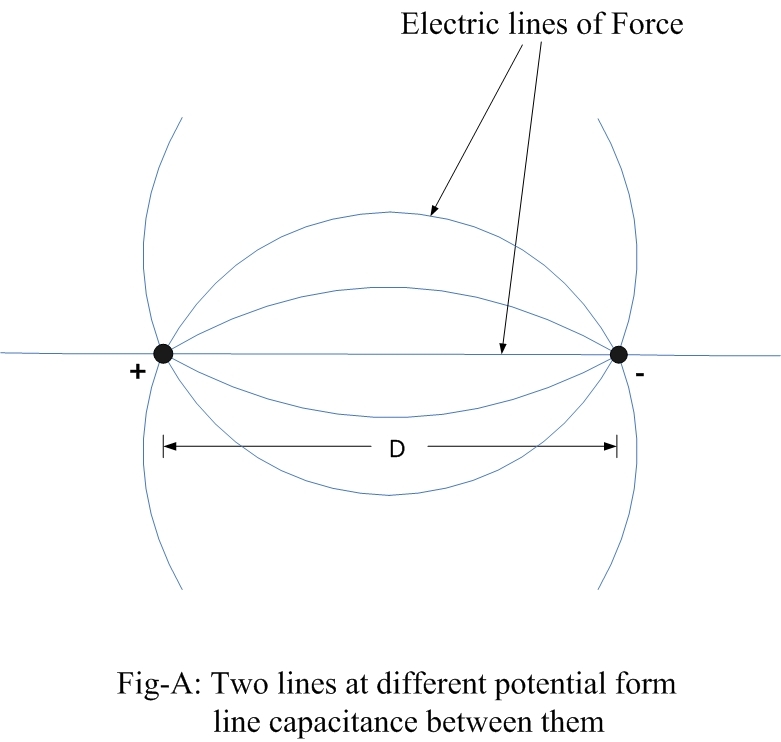 Here rest of the article is about line capacitance. Like previous article on inductance here also I am not going to derive the formulas for capacitance for different line configurations rather to develop some concepts. As the flow of line current is associated with inductance similarly the voltage difference between two points is associated with capacitance. Inductance is associated with magnetic field and capacitance is associated with electric field. The voltage difference between the phase conductors gives rise to electric field between the conductors ( see Fig-A). The two conductors are just like parallel plates and the air in between the conductors is dielectric. So this arrangement of conductors gives rise to capacitance between the conductors. 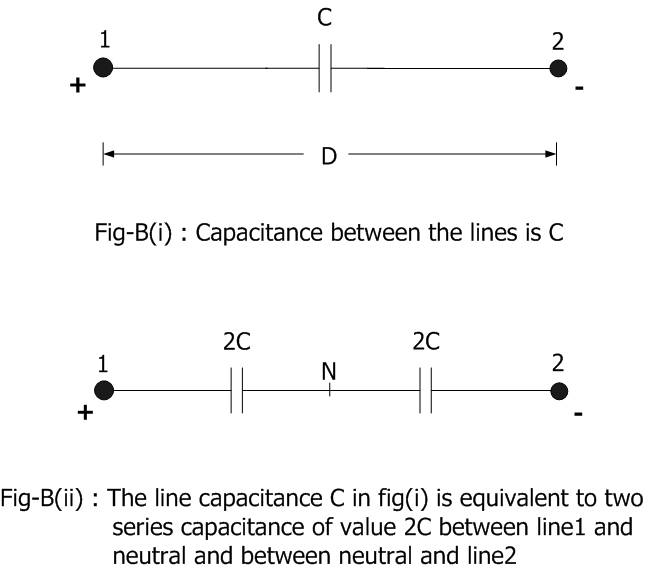 The value of capacitance depends on the configuration of conductors. We will discuss few configurations and the corresponding capacitance value. k is the permittivity of air. Note: In this article capacitance is always per meter of line length. So the unit is F/m . formula where we used the equivalent radius r' which is 0.7788 times the actual radius r.
neutral is desired for per phase analysis of power system. 2C, one between line-1 and neutral(N) and other between neutral(N) and line-2. See Fig-B. sum of the two capacitances. 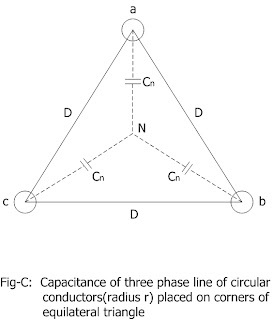 So the line to neutral capacitance Cn is two times C.
Now let us consider our favorite case of three phase circuit(see Fig-C) where the phase conductors (a, b and c) occupy the corners of equilateral triangle. The conductors are equidistant from each other. 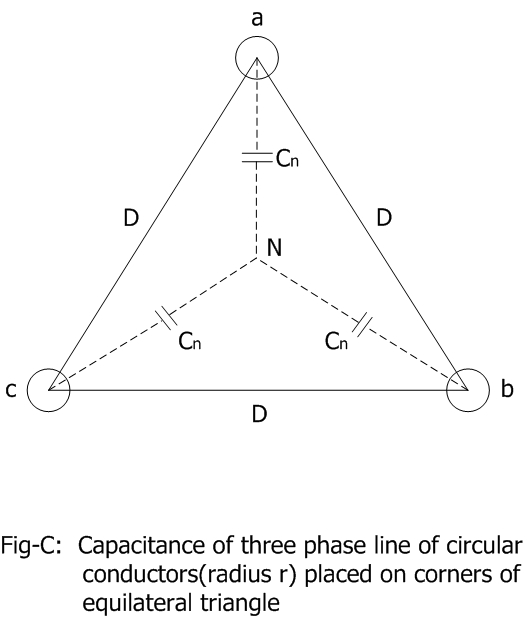 If Cn is the capacitance from line to neutral N (per phase capacitance). Note that point N is imaginary not physical. conductors are D12, D23 and D31 . The distances are between the centers of bundled twin conductors. equation is actually derived considering transposed lines. 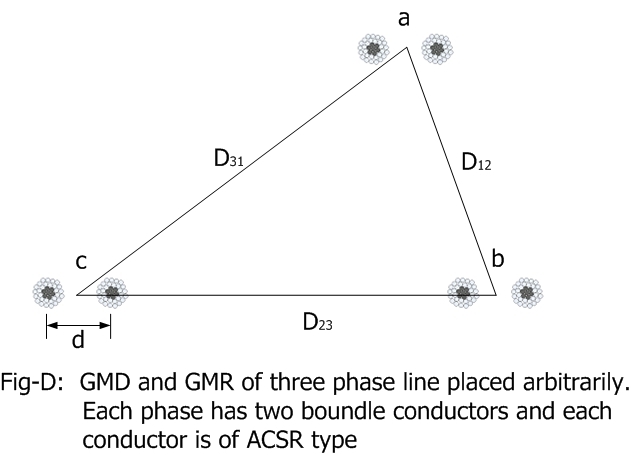 In fig-D ACSR twin bundled conductors are used for which GMR is calculated as below. two ACSR conductors per bundle(twin) are used in each phase a, b and c.
In Fig-E is shown a three phase line (in power sector a three phase line is usually simply called as single circuit line. If the tower is carrying two numbers of such three phase lines then it is called double circuit line). The line is assumed as transposed. Here each phase conductor is comprised of four numbers of conductors(quad conductor). The conductors within a bundle are arranged in a square of side d.
per the manufacturer's data is used in place of r. Ds is the equivalent radius of stranded conductor. The values of GMD and GMR are put on the above equation to find line to neutral capacitance. So far we only considered one three phase circuit (single circuit). An example of double circuit will be considered exclusively in next article for both inductance and capacitance calculation. Earth being at zero potential influences the electric field. Some electric lines of force originating from conductors terminate on earth surface at 90 degrees. The presence of earth is tackled by considering imaginary image conductors placed below the earth, just like image of real conductors. 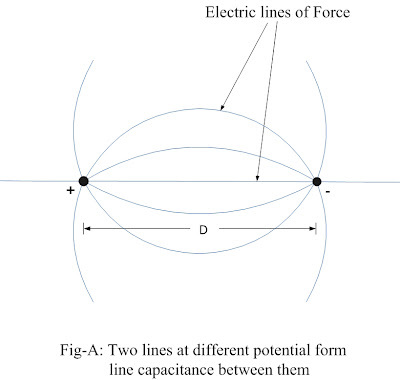 However the influence of earth on the capacitance of line is small in comparison to the line to line capacitance. So the influence of earth is neglected in many cases. We discuss it here. When the line parameters for all the three phase conductors are nearly equal, then the line voltages at the other end of the line are more or less balanced. Of course the balanced three phase system can be solved by considering any one phase and neutral. This is called per phase analysis. It should be remembered that here neutral does not mean the requirement of a neutral conductor for transmission. 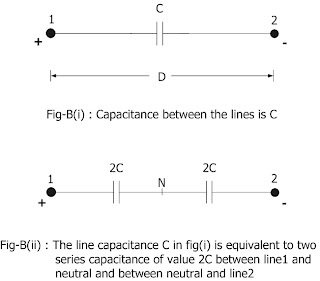 Although the above general formula for capacitance derived considering transposed lines, but it is often used for non-transposed lines to get approximate values. why the transmission lines conductor shuffles from pole to pole ? ?can anyone explain please? ?